The LG Optimus Pad has been a long time coming. After months of persistent rumours, LG finally announced its 3D tablet at MWC in February. Rebadged as the T-Mobile G-Slate in the US, it was long rumoured that the Optimus Pad would pair 3D video capture with a glasses-free 3D display like the one on the Nintendo 3DS and LG's own forthcoming Optimus 3D handset. However, that turned out not to be the case. 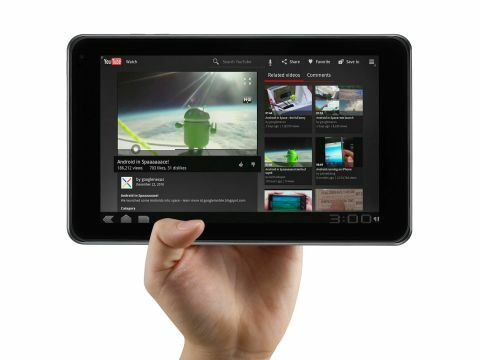 What we have here is a Tegra 2-powered Android 3.0 honeycomb tablet with dual 5MP rear-firing cameras for 3D video capture. The display is not 3D compatible in any way – it's a standard 8.9-inch LCD capacitive touchscreen with a 15:9 aspect ratio and 1280 x 768 WXGA resolution. On-board memory is provided by 1GB of RAM, while our test unit came with 32GB internal flash storage. For a long time we didn't know how much this tablet was going to cost, but it's just gone on sale in Carphone Warehouse for a scarcely believable £749.99. Yes you read that right. No, you're not imagining it - sit down before you hurt yourself. At this price, this tablet will need to deliver the moon and more to be worth recommending. So, does it have the chops? Let's find out. It's a fairly generic-looking device and feels so in the hand - it definitely lacks the wow factor of some of the other tablets we've seen of late. It weighs 630g and is substantially thicker than the likes of the Apple iPad 2 – so in general it doesn't have the same premium feel of Apple's tablet or the Motorola Xoom. It feels plasticky rather than solid. However, LG has made a big song and dance in its press materials about how pleasurable the Optimus Pad is to hold in one hand – and in many ways it is. This is an 8.9-inch tablet which means it sits between the 7-inch tablets like the BlackBerry Playbook and the 9.7-inch iPad 2. The idea is that this size gives the best of both worlds, balancing a nice, portable size with a screen big enough to watch movies on. The bezel on the left and right sides are wider than at the top and bottom, making holding it in one hand while you use the other to operate the device quite a comfortable experience. It's fairly heavy, though, at 630g, so holding one-handed is going to get quite tiresome after a while - the much larger iPad 2 only weighs 600g, remember. As is the norm with Android 3.0 tablets, the LG Optimus Pad has very few physical buttons. The on/off/standby button is located on the left hand side at the top, on the same side as the small charging port. The volume dials are located just around the corner from the on/off button on the top of the device. Then the other physical features of note are the USB and HDMI connections on the bottom and the slender speakers on each side. The 2MP front-facing camera is located in the top left-hand corner of the device, which makes it good for both landscape and portrait video conferencing, while the twin 5MP snappers on the back of the device sit front and centre next to an LED flash. There's also a slide-off hatch on the rear of the device that allows you access to the SIM port. The Optimus Pad uses a standard SIM card for 3G access, so a micro-SIM is no good here. There's no sign of an external storage port under this hatch, though, sadly. It's something that does cause us a bit of irritation – and even though Android 3.0 is currently unable to recognise external storage ports, forthcoming updates will enable this feature so it's disappointing that so many manufacturers have chosen not to include one.